Samples were collected from the mines visited on the SGA conference field trip to Shandong area Au mines in August 2005 and analysed by acoustic decrepitation. This method is useful as an exploration tool and particularly good at rapidly identifying CO2 rich fluids in the hydrothermal fluids which formed the quartz. 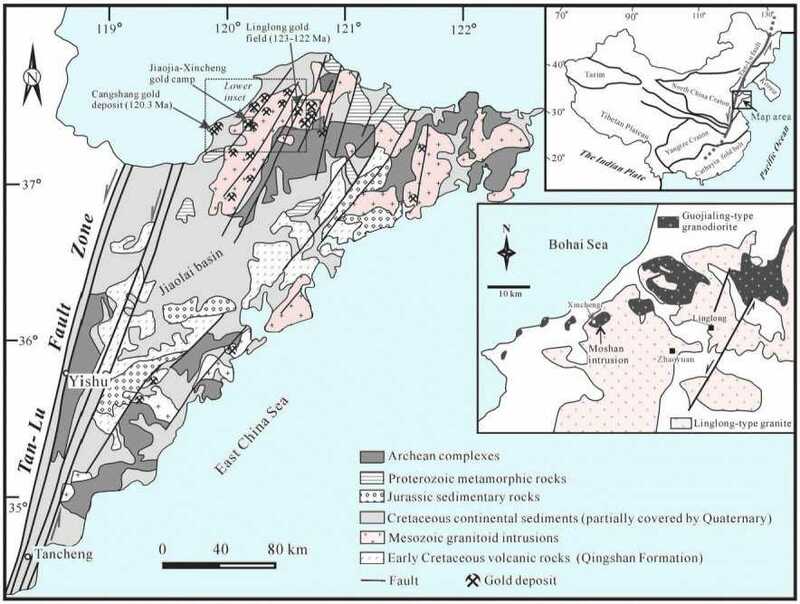 The map shows the mines sampled, which were: Linglong, Sanshandao, Canshang and Jiaojia. All of these are within granitoid intrusives. Only a few background samples from quartz veins distant from the mines were aable to be sampled. The main observation from my results is that the depositional fluids in all of these mines lack CO2. If CO2 is present in the fluids, the decrepitation results show a distinct peak between 200 and 300 C, as you can see on the examples from Archaean deposits on the third graph. This lack of CO2 also occurs at Muruntau and the Motherlode deposits in California and so I infer that these deposits share a similar fluid genesis. In general, fluids derived from metamorphic zones greater than lower greenschist facies would be expected to contain significant levels of CO2. The formation temperature of the Shandong area deposits was about 360C to 380C. 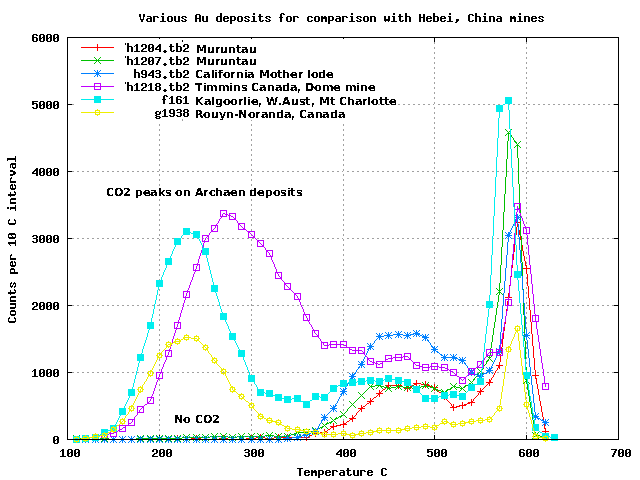 Of all the samples analysed, only sample h1916 from the Canshang pit (purple plot below) showed a trace content of CO2. This is seen as the small decrepitation increase at 250C, but this is probably less than 1% CO2 content. The formation temperatures are about 380C. None of the samples from this mine contained any CO2. The sub-ore grade sample from the ore margin (h1940, purple line) is not recognisably different from the samples within ore grade, confirming that the ore boundary is not the result of different fluid events but is a grade cutoff within a single hydrothermal system. The ore system formed at about 360 C. Sample 1941 (yellow line) is from barren quartz at the road stop in granodiorite distant from the mine. This sample contained a substantial amount of CO2, as seen by the peak at 180C. Low CO2 examples from Muruntau and Motherlode, contrasted with high CO2 samples from archean areas in West Australia, Ontario and Quebec.